Dutch Wonderland in Pennsylvania Dutch country…it rolled into history. that now carry millions of eager, happy passengers all over the world. 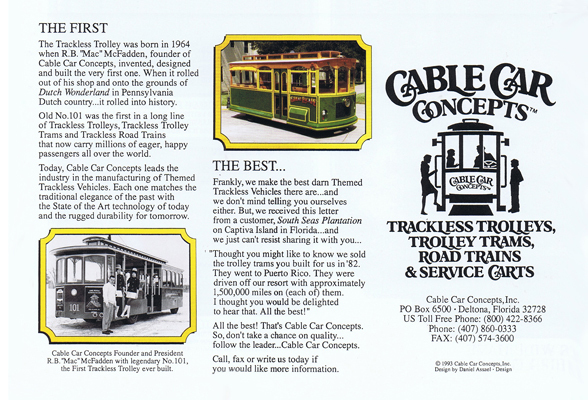 Today, Cable Car Concepts leads the industry in the manufacturing of Themed Trackless Vehicles. and the rugged durability of tomorrow. with legendary No. 101, the first Trackless Trolley ever built. on Captiva Island in Florida…and we just can’t resist sharing it with you. “Thought you might like to know we sold the trolley trams you built for us in ’82. They went to Puerto Rico. They were driven off our resort with approximately 1,500,000 miles on each of them. follow the leader…Cable Car Concepts. Call, fax, or write us today if you would like more information.